Registration through website is open until the previous evening of the race - registration accuires payment immediately. On the ski week registration is possible to do also during race office opening hours to race office located in Lapland hotel Olos Polar Kota restaurant - visit us or give us a call. Please notice we may be busy every now and then so we kindly ask for some patiency, thank you. You can register one person at a time. Please start by entering the name of the company/community/team that you represent. The final scores will display your own name and the name of your team exactly as you enter it here. As we can't change the name of your team without cancelling your entire registration (which will cause a mutation fee), we kindly ask you to pay attention to the spelling! If you don't represent any team, you can leave the first slot empty. All skiers under 18 must fill in the contact data of their parent/guardian as well. If you are still uncertain whether or not you will need bus transportation, please indicate "No transfers". You are able to book and pay for the bus in the race office until the evening before the race. Company pays your registration fee: please enter the contact data of the payer as given information will appear then in receipt. Claim registration fee by receipt from the company you have agreed with or another way is that your sponsor company will fill out the details you have provided to them and pay from company account. By submitting your registration sheet, you are signed up for the Lapponia Ski Event. We will prepare the organisational, maintenance, time tracking and result services for you according to your registration details. By submitting your registration sheet, you agree to your liability to pay the registration fee and you need to pay your registration immediately. If you are from European Union countries or Norway, Liechtenstein, Iceland, Monaco or Switzerland please do payments as you would do in domestic way. SEPA area countries (single euro payments) makes paying easy. Cancellations: registration fee can be returned against certificate made by medical doctor some weeks post event. Please notice 15 € handling fee will be taken for office costs. Changes: Office fee for making changes is 15 € and difference between chosen races. 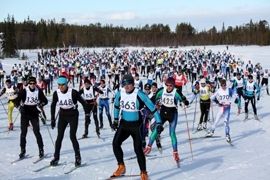 See you in the Lapponia Ski Event! YLLÄS CONNECTION TRANSFERS AVAILABLE HERE!